I was awoken, slowly, by what I thought was someone ringing our doorbell. Our doorbell is extremely quiet, and is hard to hear. Perhaps I was just dreaming. Then a sharp thumping was heard, and I knew someone was knocking on the door. The last time this happened, it was a police officer knocking on the door to inform me that our Honda Civic had been smashed into by a hit-and-run driver. This time, it was our next door neighbor knocking on the door to inform me that our Honda Odyssey van had been smashed into by a hit-and-run driver. According to my neighbor, he heard the boom of the impact, a sound which failed completely to wake me, and ran out to see the carnage. 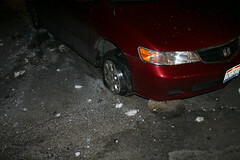 A white Chevy Impala hit our van, driving it over the curb and into the alley adjacent to our house. In the process of doing so, the van was forced over two large decorative rocks, completely demolishing the right front wheel, in addition to the devastation to the driver’s side rear door. 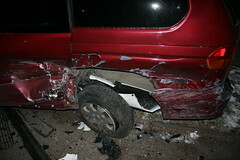 My neighbor told me that the driver of the car had gotten out and fled on foot, leaving behind an injured passenger. My neighbor then proceeded to explain that the driver was Hispanic, and that he felt it was a strong possibility that the car was stolen. I smiled and nodded, as I waited for the police, who were already on the scene, to speak to me. Two ambulances arrived, and the passenger in the car was extricated. Several people from the fire department then spent some time banging on the hood of the car, presumably trying to open it. The noise roused Carina, who somehow came to the conclusion that I had been tricked into going outside and was then being assaulted by villains. She got up and joined us outside, and spoke to the police and our neighbor while I called our insurance company and opened a claim. According to Carina, the police apprehended the driver of the car running down High Street. I never learned whether he was Hispanic, nor whether the car was stolen. Neither of those details are particularly interesting to me. Initial theories suggested that the driver was coming out of the apartment complex driveway opposite our house. This notion was quickly dispelled, though, due to the distance our van had been moved. It wasn’t likely that the Impala could have gotten sufficient speed in the driveway to ram our van in that way. What I think happened was the Impala came too fast down our street, and lost control as it hit the speed bump in front of my neighbor’s house. 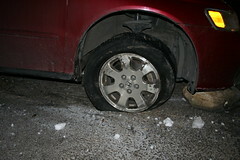 The car ricocheted off our van, spun around, and came to a stop a few yards away, ending perpendicular to the road. The insurance adjustor will be calling me first thing this morning, so now all there is to do is sit and wait.